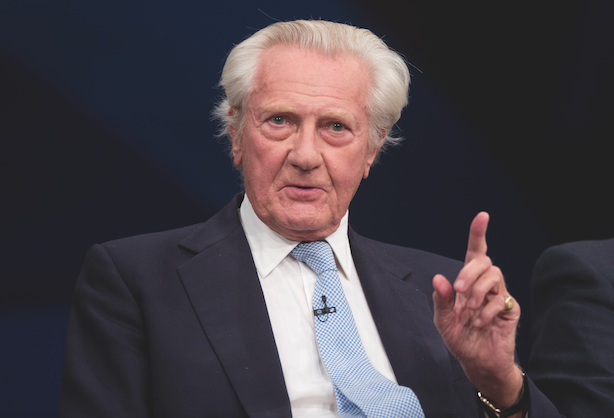 Lord Michael Heseltine - former deputy prime minister, founder of Haymarket Media Group and shadow secretary of trade and industry at the time of the last European referendum in 1975 - speaks exclusively to Danny Rogers about the next EU referendum and how we should heed Europe's dark experiences. "The EU referendum debate conjures memories that are particularly painful to my generation. We lived through events that propelled the European movement of the 1930s into frontline politics. After the Second World War, the ordinary men and women of the continent of Europe said quite simply, ‘it must never happen again’. This was a political statement, not an economic one. Whether one was on the winning or the losing side, the same burning conviction was born as young men lay wounded or dead on the battlefields of Europe for the third time in 75 years. The first evidence of this new political consensus came with the Schuman Plan [proposed by French foreign minister Robert Schuman on 9 May 1950], which sought to bring under political control the European war-making industries of coal, iron and steel. It led to the Treaty of Paris, which established the European Coal and Steel Community [ECSC], signed in 1951 by France, West Germany, Italy, Belgium, Luxembourg and the Netherlands. But Britain said no. The formation of the European Economic Community [EEC] came later. Again no-one had any doubt that this was not simply an economic concept. The evidence stared one in the face. The six nations were beginning a political process. We didn’t like it. We decided to compete with them, signing the European Free Trade Agreement [EFTA]. We had been invited by Europeans after the war to lead their closer relationships but we declined. We saw ourselves as the victors. We had deep and appropriate loyalties to the Commonwealth and Empire, a ‘special relationship’ with the United States. Despite Churchill’s great rhetoric about a ‘kind of United States of Europe’ [in a speech to the University of Europe in September 1946] we were not prepared to throw in our lot with the combining nations of Europe. If one listens to the brilliant tapes of [legendary BBC broadcaster] Michael Charlton, most evocative for me was a recording of Rab Butler, the architect of the post-war recovery of the Conservative Party, who said: ‘It wasn’t on. It wasn’t on. We were quite wrong of course. It wasn’t on.’ However, within a flicker of history’s eyelid it began to dawn on the Conservative Party the mistake that it had made. In 1960 the great Harold Macmillan made his famous ‘winds of change’ speech. EFTA was disintegrating as it realised the growing significance of the European Community and its members sought to join it. Charles De Gaulle [French president 1959-69)] vetoed our application to join the European club. He believed the UK lacked sympathy with the political nature of what was happening. As I look back on my political life, it is easy to see why he felt that. Under Ted Heath [prime minister, 1970-74] the Conservatives secured accession to the Treaty of Rome by joining the EEC in January 1972. The debate was bitter and the only way Harold Wilson [PM, 1974-76] could hold the Labour Party together was by holding a referendum in June 1975. From Britain’s point of view we began to pay a heavy price for allowing Europeans to design a modern European economy in our absence. The present agricultural policy was designed to suit France and Germany. We were not at the table. We complained of course, but if you join someone else’s club it is not easy to convince them to change the rules. The biggest transfer of sovereignty in the history of this country was the Single European Act ratified in The Hague in 1986. 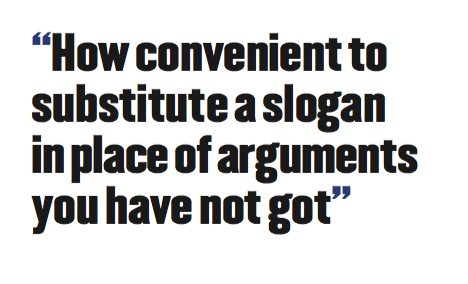 Margaret Thatcher was faced with a simple but unpalatable dil­emma. The Europeans were preparing a significant stepping up of the European market. It meant taking the individual national standards and specifications of industries of the various countries and replacing them with a single set for the whole market. 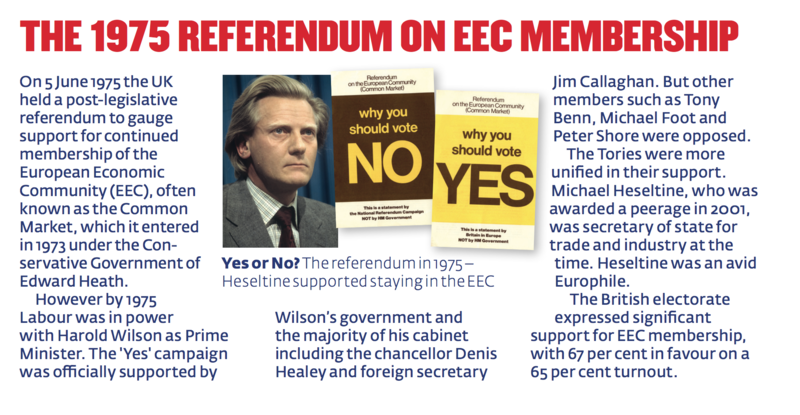 It’s exactly what the EEC was set up to achieve. It was exactly what an experienced politician would dread. And so it turned out. The late 1980s saw economic stress and some 400 different regulations passed through Parliament; terms and conditions for businesses that wished to trade in Europe, their single biggest market. There was a plan B: to blame Brussels. And, with the enthusiastic support of sections of the British press, Brussels became the scapegoat. Mrs Thatcher was absolutely right to take the decisions that she did but shifting the blame to Brussels is a major cause of the Euroscepticism that exists today. Day after day there is more evidence of the damage that would be done if we were to leave the EU. It is the single biggest weakness of the Brexit camp’s case that they really cannot say what would happen in consequence. I personally feel humiliated that we should accept the role of a Switzerland or Norway, which not only pay to trade with Europe but have to accept the rules with no real chance to influence them. Is that a workable solution? Not for the sort of Britain in which I believe. It leads on to the issue of sovereignty. I can make speeches along with the best of them about 1,000 years of Britain’s achievements. And I do it with pride. But the responsibility of politicians is to look forward to new opportunities, to warn about the dangers, to tell the truth. The concept of sovereignty – whether it is sending infantry over the top or blockading someone’s port – has changed in this shrunken globe. We were ‘sovereign’ back in 1940 – Churchill spent 18 months trying to get President Roosevelt to reverse his categorical statement, in 1940, that America would not enter the Second World War. It was Hitler who declared war on America, well into 1941. Today we have total control of our borders for criminal drug trafficking. Drugs are freely available. Climate change, environmental degradation, nuclear and chemical weapons, tax havens, global capitalism: all have forced nations to work in cohesion with each other. They have forced the wider inter-dependence of countries, particularly on intelligence. So, yes, this country could opt out. It could take a sort of mid-Atlantic detachment. But that is not the Britain of which my speeches were made. We are a top table player. We sit within the deliberating councils of the world’s most powerful groupings – as a member of the EU, as a member of the Commonwealth, and with a valuable relationship with the United States. We have evolved the might of our imperial power into a diplomatic triumph well beyond any numerical entitlement of a small island nation. So, yes of course we would not disappear. There would be a Britain – providing Scotland stayed, of course – but it would not be the Britain that my generation helped to create, and in which it passionately believed. On the referendum debate itself, I am deeply depressed. There is an old saying in the PR industry, in which I have spent much of my career: ‘Tell it big, tell it often.’ I am appalled to find leading members of my own party so treating the Prime Minister who has led us back to power. It is his duty to advise us on the risks of this major political decision. Telling one to look right before crossing the road is not the politics of fear – it is the prudent advice of someone anxious to preserve their friends’ wellbeing. 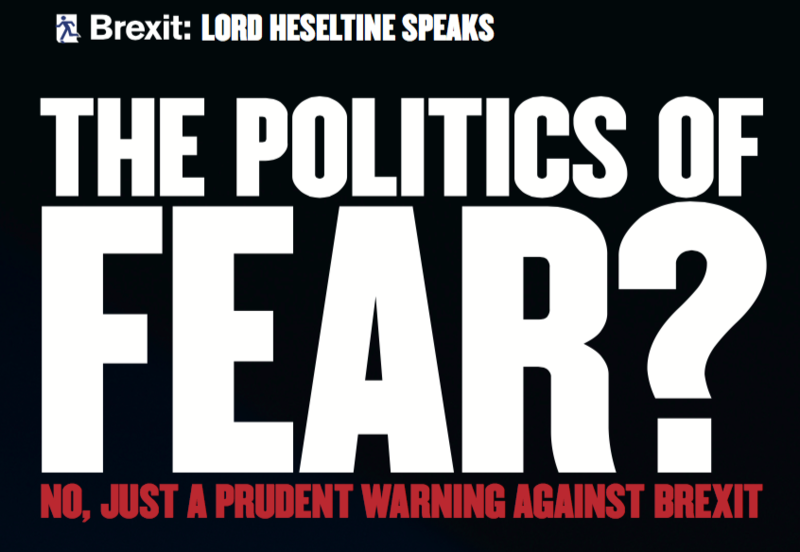 Yet any time the Prime Minister – or the Governor of the Bank of England, a leading scientist, soldier, industrialist or a head of state – warns about the risks, it is sloganised as ‘the politics of fear’. ‘Tell it big, tell it often.’ How simplistic a way to dismiss warning after warning and how convenient to substitute a slogan in place of facts and arguments that you have not got. I have my fear that Brexit would des­troy the very nature of the country that we are; diminish the people we believe ourselves to be; undermine the future of the generations that succeed us."